Ever since the 70’s when the liberal Feminist Movement began, liberal women have been crying ‘Sexual Harassment’! The feminists never make an objection about liberal attacks on Conservative women, but they join the liberal media in denouncing them. As a conservative woman, debating in opposition to the Equal Rights Amendment, I was subjected to the feminist vitriol against all traditional women who did not wish to step down to equality with men. Why should we when we were enjoying all the rights loving wives and mothers could wish for? The feminists would like to have women drafted into military service and to serve in foxholes alongside men. They overlooked the difference in upper body strength in men and women and the risk to men who have been raised as protectors of females. Also, the pregnancy rate of women serving in close quarters with men in military service is another problem. If a man even looked at a feminist in an admiring manner, or called her ‘sweetheart, baby or honey’, the gals would cry ‘Sexual Harassment’ (although I did not see many man-hating feminists that most men would find attractive enough to speak endearing words to). If women do not wish to be admired by others, both men and other women, then why do so many women dress attractively and/or provocatively? Any grown woman worth her salt should know how to gently rebuff unwanted comments or advances without filing ‘sexual harassment’ charges when remarks or suggestions she considers ‘inappropriate’ are forthcoming. However, if rejection of sexual advances by her boss should include threats of loss of employment then that classifies as ‘sexual harassment’ in my opinion and should be reported. Under threat of a Sexual Harassment lawsuit, whether or not justified, it is much less expensive for a company or organization to just fork over big bucks to settle out of court. Unfortunately, this often unjustifiably enriches trouble makers and still leaves the falsely accused with a question mark by his name. Protect American Sovereignty--get America out of NAFTA, CAFTA, WTO and other international trade associations which are controlled by international tribunals. Conservative Patriots--Remember to keep your eye on the goal of unseating Obama and electing a Conservative House and Senate. Herman Cain can quite likely beat Obama as the campaigns stand now and is probably the reason for the unsubstantiated personal attacks against him. This is good news to the Democrats and probably to the Republican establishment. 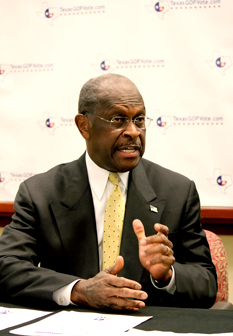 Herman Cain brings to the people Commonsense which is rare, Right Principle which is rare, Business Experience which is totally lacking in the Obama administration, Faith, and an Outside-the-Beltway approach to problem-solving. Possession of these traits will enable Cain to seek policy advice on Foreign Policy, Economics and Homeland Security from those who know and are of like-mind. Preservation of our American Way of Life calls for a president with these qualities. It does scare me that anyone can have such a warped view of life. Get out and get some air. Maybe it will clear the fog in your brain so you can think clearly. Shirley, your article concerning sexual harassment was bizarre in the first instance as it seems to hark back to a time when women didn't have the vote and were the chattels of men. You appear to be living in a delusion that being belittled by men is somehow a validation of the "little woman" that you claim to be: all defenceless and needing a big man's protection. To stand up to a man's bullying does not make a woman ugly, or a feminist really, just someone with self-respect; something you evidently don't have.